Our Technical Manager Matteo Lelli presented the paper “The Important Role of Execution and Construction Quality Assurance (CQA)/Construction Quality Control (CQC) Plans in Building with Geosynthetics”, at Geosintetik Indonesia 2017 in Central Jakarta on October 3rd. The paper offers best practice guidelines for construction procedures and when building a reinforced soil structure with geosynthetics. 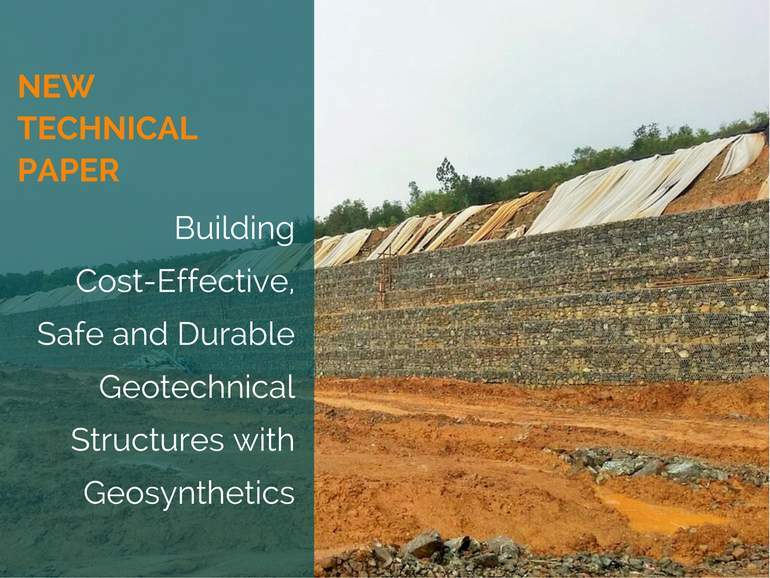 The use of geosynthetics for the construction of Mechanically Stabilized Earth (MSE) retaining structures, such as our Terramesh® System, is constantly growing in Indonesia. These structures are becoming essential elements of many infrastructure design and construction projects (airports, railway, highway etc.) all over the country. They are also being used effectively for landslide remediation measures. Reinforced soil structures are increasing in popularity as an alternative to traditional mass gravity retaining structures such as reinforced concrete and stone masonry walls. The main factors driving the choice of those innovative structures are their cost-effectiveness, reliability and most importantly, their capacity to tolerate large post-construction differential settlements; especially important when building infrastructure over poor ground, or in seismic areas. Despite this growth, there are a number of retaining structures built using geosynthetics showing excess of deformations or even collapsed in Indonesia. The cause can be attributed to the lack of experience of contractors and supervisors regarding construction with geosynthetics combined with the unsuitable CQC and CQA plans. During his presentation, Matteo Lelli explained some simple but effective step-by-step construction procedures starting with geosynthetics handling on the jobsite, to backfilling operations, and structure finishing. Moreover, he highlighted the importance of a well-planned and properly executed drainage system. The construction steps provided aim to offer best construction practices and guidance for project owners, contractors and design engineers. If you missed the Geosintetik Indonesia 2017 Conference, you can read the full paper here.